You don’t often get to see 500 Japanese zombies in older age whooping it up on stage but that’s what has been happening in Saitama, near Tokyo. The theatre will be known to some as the artistic home to Yukio Ninagawa, one the greatest theatre makers of the last half century who died in 2016. Revered for his magnificent productions of Shakespeare (I saw Macbeth at the Barbican in 2017 and like many was in awe of the beauty of his Samurai retelling), he also established Saitama Gold Theatre of older actors. 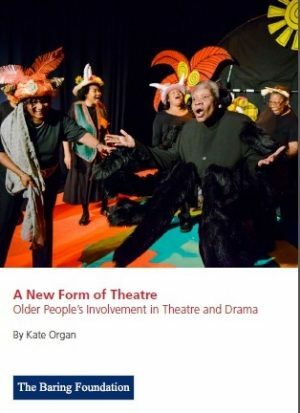 Kate Organ’s report for us – A new form of theatre – describes this more fully and surveys the phenomenon of an increasing number of professionally directed British companies of older actors. We support a very active network of these led by the Royal Exchange Manchester. The Imaginary Invalid, Saitama Gold Theatre. Photo by Maiko Miyagawa. The Imaginary Invalid was the centrepiece of a typically ambitious initiative by the Saitama Arts Theatre intended to extend Ninagawa’s legacy and launch an international festival, World Gold Theatre 2018. Connections between Japan and the UK, reported in our report Living national treasure, were much in evidence. David Slater of Entelechy Arts transposed Bed from the windswept streets of Deptford to the equally rainy ones of Saitama with Japanese actors, creating huge interest. 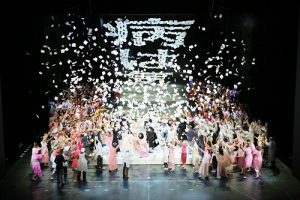 The Company of Elders from Sadler’s Wells has created huge interest in Japan and Saitama hopes to form its own company. In the meantime, they performed three pieces and one of their choreographers, Adrienne Hart, also work-shopped a piece with a mixed British/Japanese group of older dancers. 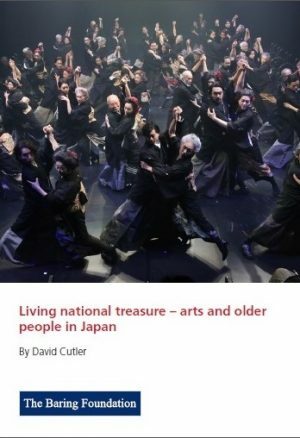 Connections between Japan and the UK, reported in our report Living national treasure, were much in evidence. 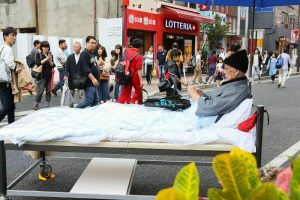 Entelechy’s ‘Bed’ comes to Japan. Photo by Maiko Miyagawa. I needed to sing for my supper by giving a talk to a symposium, as did Ann Gallacher from Luminate in Scotland. I was fascinated to hear the talk by Ai Liang Chua from the National Arts Council of Singapore. As part of their broader approach to inclusion and on the back of national research about cultural participation of older people and its beneficial impact they launched a Silver Festival in 2012. This takes place annually in September and is confined to weekends to promote involvement by families. 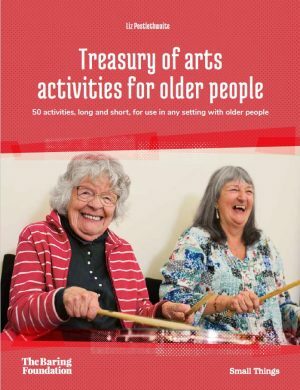 The Singaporean Arts Council also has an Artreach programme going into care homes and has developed a series of online training resources for care workers to use the arts. And lastly I will long remember an immersive piece called ‘Night Never Gets Darker’ created by Naoki Sugawara. 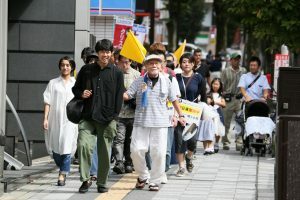 Describing himself as a director, actor and carer he has founded a company called OiBokkeShi which can be translated as the ‘ageing and theatre’ company. He has used theatrical techniques to provide care for people with dementia. Night Never Gets Darker was created for performance in the streets of Okayama where he is based and was transposed to Saitama for the festival. The audience follows a young man who has returned home to meet in the street a much older friend who is apparently searching for his wife who is living with dementia and is lost. 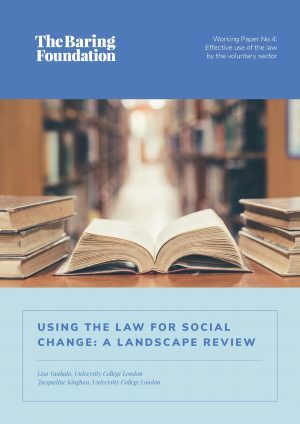 It is a fascinating and thought-provoking work. Perhaps it should come to Deptford. It is a fascinating and thought-provoking work. Perhaps it should come to Deptford. Night Never Gets Darker. Photo by Maiko Miyagawa. I felt very honoured to be part of this amazing first international festival and frankly astonished to be told by the organisers that the idea for it had come in part from a trip I made with colleagues there in 2015. 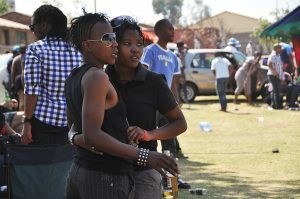 I am delighted to say this is set to be the first festival of many. Maps the growing phenomenon of Older People’s theatre companies throughout the UK.